The above info came from Clarissa d'Orival, and was edited by yours truly (contact me). The image came from Photobucket. 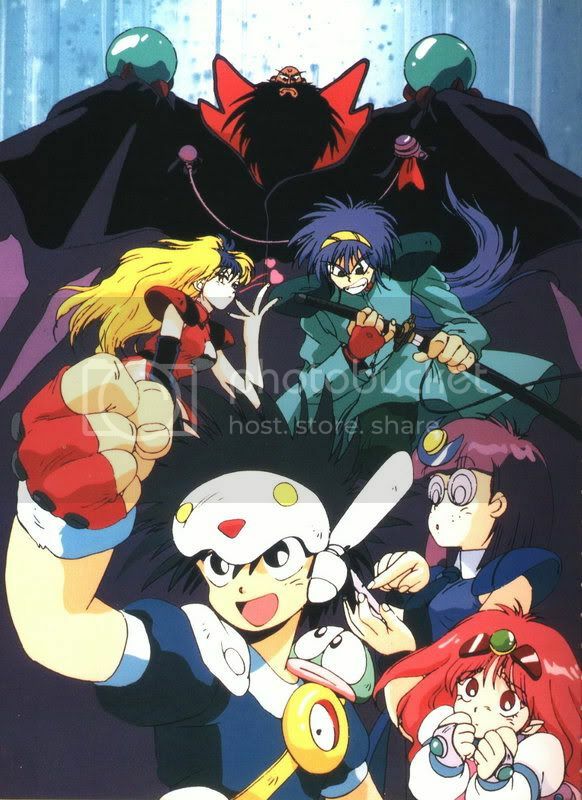 Ng Lamune & 40 is the first anime of a long running series in Japan (from 1990 - 1997 for the whole series, OVA and all). We, however, are interested in the very first series! Lamune is a normal young boy who apparently loves playing video games. One day after school, however, he encounters a mysterious young girl selling a video game called "King Sccasher". Lamune helps the girl to sell all the copies before taking even a small gander at the game, and realizes she had just disappeared. When he came home he immediately started playing the game and beat it on the same night he started. After beating it, the girl he saw from earlier introduced herself, saying her name was Milk, and pushed him into the game! Now Lamune has to save their world, as he is the direct blood relative of Lamuness, the hero of their World. He is helped by Cocoa, Da Sider, and Miruku. The above description came from Clarissa d'Orival, and was edited by yours truly (contact me).